When starting a new garden it pays to run a few tests on the soil to find out what percentages of sand, silt and clay you have in the ground. It will tell you a lot about what you can plant and what kind of amendments you may need to add to the soil to make it garden ready. There are two easy tests you can use to find out what kind of soil you have. To start off with you have to know a couple things about soil to be able to successfully use these tests. Clay is the smallest particle that makes up soil and it will have a slippery, sticky feel when it is wet. Silt is the middle sized particle and will feel slippery when exposed to water. Sand is the largest particle and the only one that can been seen with the naked eye. It will feel gritty and can make a crunching sound when rubbed together. To the left you will see what's called a soil texture triangle. It is a tool used to place soil into different classes by the percentages of sand, silt and clay in the soil. The ideal soil is a loam which you can see right in the middle of the triangle. It has ideal proportions of sand, silt and clay and would be a excellent garden soil. Unfortunately most soils are not so ideal and have either too much or to little of one of the soil components. To use the soil texture triangle is very simple but it does take some practice. Find a representative soil of where you want to put your garden and get a mineral soil sample. A mineral sample is key as organic matter from plants and roots can affect the texture of the soil. Take the sample and get it wet enough so the soil can be shaped and compressed into a ball. Then just play with the ball and pay close attention to how it feels in your hand. If its sticky and hold its shape really well it has a good amount of clay. If it feels gritty or doesn't hold its shape well then it is high in sand. Determining silt can be tricky because it can be mistaken for clay and will cause you to overestimate the amount of clay. If it feels slippery but not sticky then there is a high amount of silt in the sample. Take you best guess at what the percentages are for each soil component and consult the soil texture triangle. Find your percentages on the chart and then follow the lines from each percentage until they connect together somewhere on the triangle. 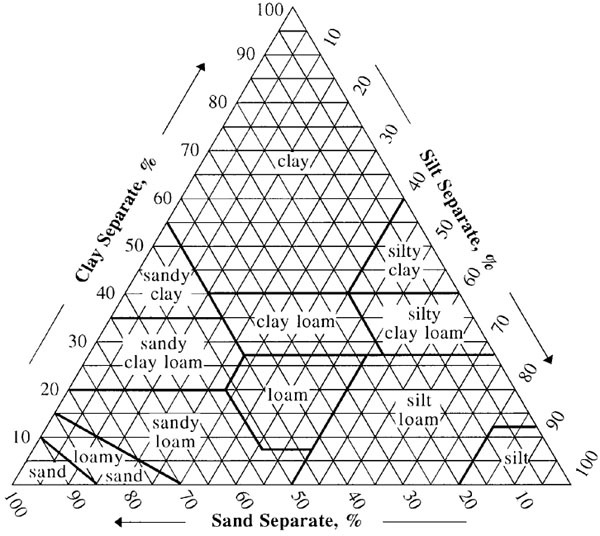 For example if you have a sample that has 60% silt, 40% clay and 50% sand it will be a sandy clay soil. The jar test is a simple and effective way for you to find rough percentages sand,silt and clay on your land. All you need is a large gallon size or bigger glass or plastic jar with a lid and you are good to go. To do a jar test is very easy, but it does takes longer that the texture triangle test to complete. Take your jar and fill it about 1/3-1/2 full of soil you wish to test. Here again it is critical to test mineral soil so make sure your sample is free of organic matter. Fill jar with water the rest of the way until you have about 1-2 inches of head space at the top. Once the jar is full of soil and water put the lid on tight and shake it until all the soil is suspended in the jar. Set the jar in a place it wont be disturbed for at least 24 hours. It may take longer than that for the soil to settle out completely and it's important to wait until the water is clear to get an accurate reading. Once the soil is settled back into the bottom of the jar take a ruler and measure the thickness of each layer of sand, silt and clay. The particles will settle in the jar by size with sand being at the bottom, silt in the middle and clay on top. By accurately measuring the layers and the whole sample thickness you can then work out with a bit of math what the percentages of sand, silt and clay are. The jar test is nice in that is doesn't rely as heavily on experience as the texturing by feel does but it does take longer. You can texture by feel as you walk around your property which can give you ideas on where you can put things like gardens, houses or anything else you might want.